We like potatoes and we like cats, so when we were told by Colorado-based Drunk Robot Games that its upcoming adventure game about cat-potatoes, A Purrtato Tail, is headed to Nintendo Switch alongside other consoles and Steam in 2019, we were understandably excited. 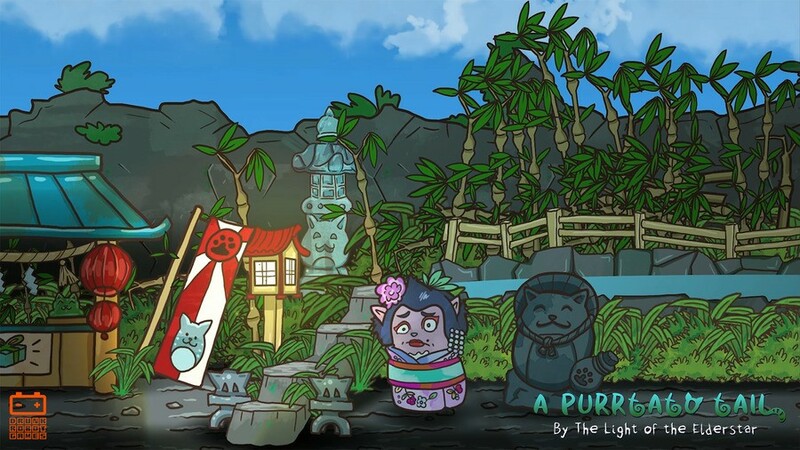 A Purrtato Tail is an open-world puzzle adventure about a race of potato cats – the Purrtatoes – on the Isle of Moar. You assume the role of Queen Pixel, who must leave the safety of her kingdom for the first time in 20 years to solve the mysterious kidnapping of her most trusted and mysterious adviser – the Elderstar. Along the way, she will encounter the Nightshades – a dangerous new sentient species of plants who threaten all cat-based life across the island. All of this is done by allowing Pixel to form ramps and bridges while using each unique characters’ abilities, such as slicing ropes, fixing and powering machines, and more. There are also encounters with a cast of fruit and vegetable cat characters, numerous quests to complete, a tea-brewing and collectable card game to play, bosses to fight, new abilities to unlock and numerous other things to discover. We had a chat with RedVonix, owner and lead developer of Drunk Robot Games, about the announcement. Nintendo Life: Congratulations on announcing the game for Switch! RedVonix: Thank you! 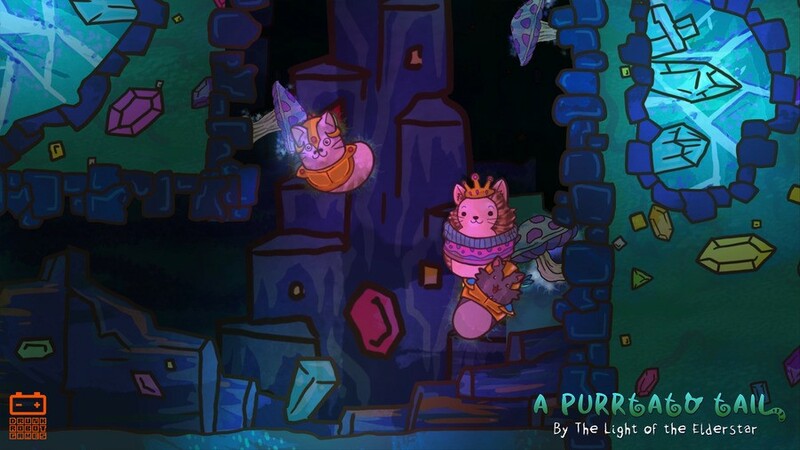 The single biggest request we have had for A Purrtato Tail is a Switch release, and we are thrilled we can finally tell the fans that they will indeed be able to take the adventures of Queen Pixel with them wherever they go. So, cats and potatoes. Such an obvious combination. How did the characters and narrative come about? It all started with my big fluffy cat, Strahd. I walked into the bedroom and saw him lounging on the bed, all curled up, and I said: "You look like a big purrtato!". My wife and I just stared at each other with this immediate shared thought of: "THAT'S SOMETHING". We originally prototyped a stage-based puzzle game about connecting characters together, which evolved into using that same gameplay mechanic in an adventure platformer. The narrative was a slow process, though the raw basics of the Elderstar, Queen Pixel, and Lord Purrmato were all there from the start. The Nightshades, The Isle of Moar and the remainder of the plot evolved over the following couple of years. There's a lot going on, gameplay wise. Is that a result of eclectic tastes within the team? Much of it came from us asking ourselves, "What do we want to do while exploring the world?" We've got the main gameplay mechanic of connecting characters to reach new areas and using their abilities to solve puzzles - but what to do when you've reached a new area and aren't solving puzzles? How about fighting enemies - we tried that and it flowed well, and using the character-connecting mechanic added an interesting addition to combat. Then we thought - safe zones! So we have cities, which have NPCs to talk to, shops, and things to do, like quests. But what about a minigame? We didn't want to go crazy with minigames, so we thought - let's do just one minigame, and make it a game-long minigame. So we added a card collecting minigame that can be played with NPCs - which itself was heavily inspired by Triple Triad in Final Fantasy. The rest of the various elements just sort of evolved in a similar way; of finding a void in the game and wanting to fill it, and we kept doing that until the design and the game felt complete. How are the different elements balanced? Extremely carefully! I've actually got a notebook for the game that has all the main story elements planned out, gameplay elements, game mechanics, etc. There are also whole pages of just math that place the different key game elements together. Those pages partner up with some spreadsheets we use that allow us to plug in key values - enemy attack values for an area, anticipated player defence value at that point in the game, along with a bunch of other variables, and shows us a balance graph. This was then adjusted until it became an overall steady ramp. 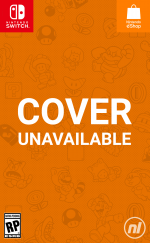 Are there any Nintendo franchises that influenced the game? Breath of the Wild was a huge inspiration for our UX and the tea crafting mechanic, and Super Metroid served as a basis for much of the feel of our character movement and world map system. The whole idea of each moon in Super Mario Odyssey having a unique name, description, and time / date of being found we flat out borrowed for the Shards the player finds throughout the Isle of Moar. We've been playing Nintendo games since we were kids so there's a lot of Nintendo inspiration in there; more than I'm thinking of currently. With the game releasing next year, is it a case of refining or are there still ideas floating around? The design and story are pretty solid at this point. We're pretty much in full production now, developing the scenes and assets, cinematics, game events, etc. We're going to be doing a Kickstarter in January as well to raise the last little bit of money we need to finish up production of our game art and to hire a really great 2D animator to make the game animations really pop. We would like to thank RedVonix for his time. A Purrtato Tail releases in 2019 for the Nintendo Switch, Xbox One, PlayStation 4, PC, and OSX platforms. This looks absurd, I love it! 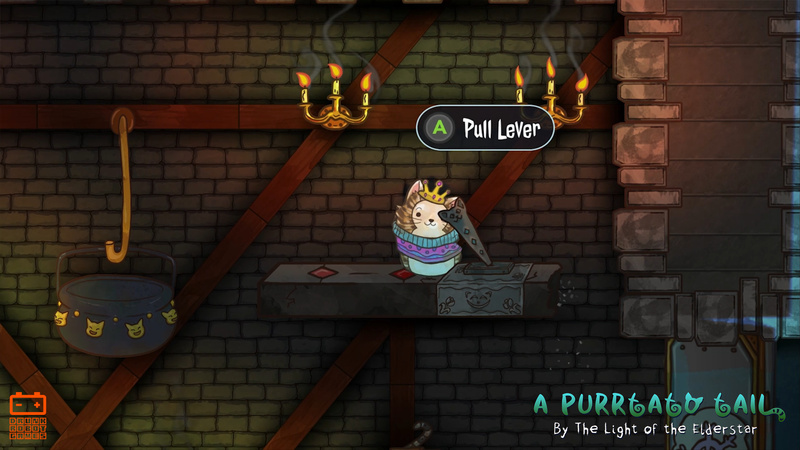 A spooky platform adventure about limbless medieval cats? Holy god, this looks like good. Not the cat metroidvania I'm waiting for. This looks more like Night in The Woods. It intrigues me. The right price and an at least not horrible review and this game will be a day one buy. @jhewitt3476 I mod r/metroidvania and I see the same problem everywhere. EVERYTHING is a metroidvania these days. It has become synonymous with 'game that has adventure elements' or 'game that is non-linear in some way'. Trying to argue for clarifications and restrictions to the "genre" (it's not a genre) is hopeless, as the community is outraged at any attempt to do so. The art is gorgeous. The concept is great. That platforming looks....terrible actually. It almost looks like touch-screen platforming. Hard to tell from a video but it looks like it's snapping to platforms or something. Got enough "metroidvanias" in backlog and upcoming. But never enough games about cats. Quite the conundrum. Shouldn't it be a Metvania? You take one syllable from Metroid and Castlevania to form the new word? Or it could be a Castleroid. I'm really bothered by the lack of limbs on these felines. Considering how these cats look, I would have preferred it if they called this A Catryoshka Tail, and you could unlock and use the different sized cats to get to certain areas. This looks weird and adorable and I will almost certainly be getting it as soon as it comes out. @jhewitt3476 Dracula likes blood, remember! @Ryu_Niiyama Glad I'm not the only one. I loved the bizarre concept of this game but the limbless cats turn it altogether too creepy.